Equipped with BMW's most powerful four-cylinder engine. After countless spy shots and rumors, the new range-topper in the BMW X2 lineup is finally here. Meet the M35i, which although is based on a front-wheel-drive platform, it will only be available with an xDrive setup. The flagship X2 marks two premieres for the Bavarian company as not only does it have the first M Performance-branded four-cylinder engine, but also the most powerful version of a four-cylinder unit ever installed by BMW in a production model. 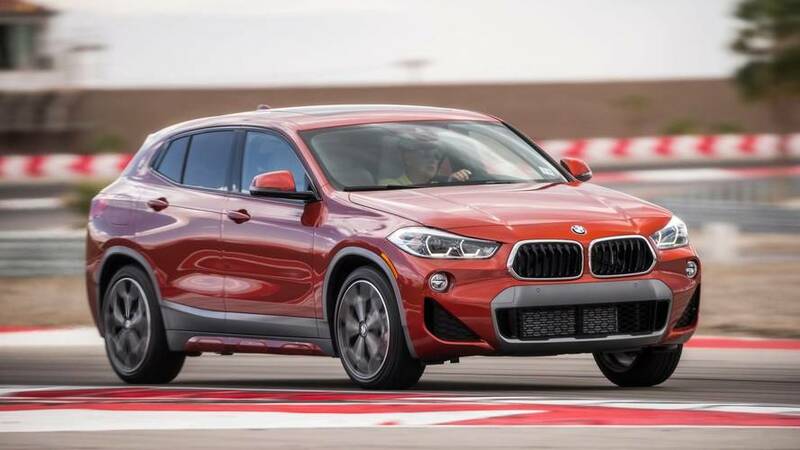 Come to think of it, the new BMW X2 M35i is also the first M Performance model to get an M Sport differential in the front axle, which diminishes traction losses on the front wheels while the crossover is being driven in a lively manner. Fitted with a reworked cooling system, the turbocharged 2.0-liter gasoline engine has been tweaked to unlock 302 horsepower (225 kilowatts) and a peak torque of 450 Newton-meters (332 pound-feet). The output is channeled to both axles with help from an eight-speed Steptronic transmission equipped with launch control and blessed with “M Performance tuning.” This hardware setup enables the X2 M35i to reach 62 mph (100 kph) from a standstill in just 4.9 seconds. Aside from getting a beefier engine, the high-end crossover has also gone through a series of other upgrades to make it worthy of the M Performance badge. It has goodies such as an adaptive suspension with two selectable modes, an M Sport braking system with 18-inch front and 17-inch rear steel discs, and tweaked steering to make the X2 feel more agile and nimble through the corners. When it comes to design, the M35i gets the M Sport Package as standard combined with a Cerium Grey paint finish and dual tips for the sports exhaust. Should you feel the standard 19-inch rims are too small, BMW will be more than happy to install an optional 20-inch set with a two-tone finish. Full LED headlights and fog lights come as standard, as does the M spoiler at the back. Much like with the exterior, the X2 M35i’s cabin is based on the M Sport Package and can be had with optional M sports seats for greater lateral support for those sitting in the front. These can be ordered in one of the three available designs and come with matching M seatbelts for a cohesive look. The leather-wrapped M Sport steering wheel with shift paddles rounds off the list of niceties. BMW says it will commence production of the X2 M35i in November, but the assembly of Euro-spec cars won’t begin until March next year. The new BMW X2 M35i: M DNA for the most powerful compact Sports Activity Coupe. Top-of-the-range model delivers dynamic handling characteristics and an exciting design for an impressive first appearance. Munich. Sportiness coupled with a polarising appearance – based on this formula, the new BMW X2 has inspired above all a young and modern target group following its premiere in March 2018. With its extroverted design, the BMW X2 interprets the character of a premium SAC (Sports Activity Coupes) in an entirely new way within the compact segment. The top-of-the-range version of the BMW X2 is the M Performance automobile. BMW is now presenting the new top model of the X2 series. The wide BMW double kidney grille of new BMW X2 M35i (combined fuel consumption 8.4-8.1 l/100 km; combined CO2 emissions: 191-185 g/km)*, features a surround in Cerium Grey for visual differentiation at first glance. Likewise, the surrounds of the air cooling inlets and the exterior mirror caps are finished in Cerium Grey. The rear of the X2 M35i is characterised by the standard M rear spoiler and two specially designed exhaust tailpipes, which also come in Cerium Grey. BMW’s most powerful 2-litre TwinPower Turbo engine. The new BMW X2 M35i featuring a 225 kW (306 hp) 4-cylinder turbocharged petrol engine definitely sets new benchmarks above the previous versions. As the letter M in the type designation clearly signalises, the new X2 M35i possesses the impressive dynamic handling qualities of an M Performance automobile. Behind this is yet again the BMW M GmbH, whose racing know-how flows into the development of all components. The 2-litre TwinPower Turbo engine concealed under an M Performance cover is the very first M Performance four-cylinder engine and at the same time BMW’s most powerful version. It delivers a fascinating maximum power output of 225 kW (306 hp). Maximum torque is an extremely powerful 450 Newton metres. To ensure that this sheer power is securely transferred to the tarmac, the X2 M35i comes as standard with intelligent four-wheel drive technology xDrive in conjunction with the 8-speed Steptronic transmission including Launch Control. The automatic transmission features specific M Performance tuning. Equipped in this way, the BMW X2 M35i is able to accelerate from 0 to 100 km/h in just 4.9 seconds*. The necessary thermal stability of the engine is now ensured by a redesigned cooling system. 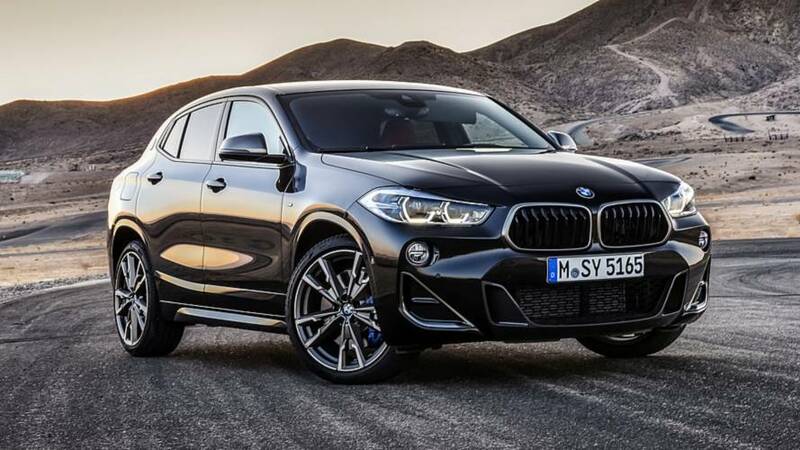 Being a typical M Performance automobile, the BMW X2 M35i features, in addition to a powerful engine, also a M Sport suspension system that has been specifically tuned and adapted to match the car’s sporty character. A adaptive suspension offering two different manually adjustable modes and combining maximised sportiness and driving comfort is also optionally available. A particularly special technical highlight – and also a premiere for an M Performance automobile – is the M Sport Differential installed in the front axle gear. During highly dynamic driving manoeuvres, this locking differential most effectively reduces possible traction losses on the front wheels. In addition, the braking system has been upgraded for use on the X2 M35i. The M Sport braking system with fixed callipers in Dark Blue metallic and 18-inch steel discs at the front (17-inch at the rear) guarantees consistently short braking distances even under the highest loads. With that, however, the M know-how is still far from being exhausted. Steering and suspension have also both been adapted to match the performance of the drive system. For instance, thanks to a special setup, the M sports steering conveys to the driver an impressively direct and precise steering feel. Furthermore, the X2 M35i comes as standard with the M Sport suspension with a stiffer spring and damper setting as well as vehicle lowering. The rear axle construction has been redesigned. A suspension with an adaptive spring and damper combination offering two different manually adjustable modes is also optionally available. Upgraded exterior design thanks to M Performance typical elements in Cerium Crey. The sporty aspiration of the X2 M35i, which is the result of its inner qualities, is reflected in an exciting exterior design with numerous typical M Performance Automobile elements finished in Cerium Grey and based on the X2 M Sport Package. This begins at the front with full HD technology for the main headlights and fog lights and continues with the double kidney grille in Cerium Grey and the newly designed side air intakes of the same colour at the front for best possible cooling of brakes and engine. The exterior mirrors have been upgraded by special caps, likewise in Cerium Grey. At the rear, the X2 M35i boasts a distinctive M rear spoiler and demonstrates its fascinating sovereignty with an M Sport exhaust system with two tailpipes (each 100 mm in diameter). Thanks to the adapted silencer system, the exhaust system produces a particularly sporty sound spectrum. 19-inch M Sport light alloy wheels in 715M styling (optional: 20-inch M Sport light alloy wheels in 721M styling and in Cerium Grey bicolour) impressively round off the exterior design features. An exceptionally sporty look also dominates the interior. As with the exterior design, the basis is again the M Sport Package. Moreover, the X2 M35i features as standard an M Sport leather steering wheel with shift paddles and door entry trims at the front bearing the lettering “M35i”. The optional M sports seats at the front are a novelty. They offer not only perfect lateral support for both driver and front passenger in sharp bends, but also the highest level of comfort and safety through integrated headrests. The M sports seats are available in the following three different designs: FabricTrigon/Alcantara combination in black with blue accents, Leather Dakota Magmared, perforated with black accents and Leather Dakota black perforated. Matching seatbelts in an M design are also on offer. In addition to the uncompromisingly sporty orientation of both drive system and design, the BMW X2 M35i also demonstrates BMW’s trend-setting digital competence in the areas of operation and networking. For instance, the full-colour BMW Head-Up Display is among the optionally available features. It offers a display range that is unprecedented in this vehicle segment. If desired, the latest generation of BMW ConnectedDrive and the new BMW Connected App can be fitted. Optional functions such as the wireless use of Apple CarPlay set further highlights. Driver assistant systems include, for example, camera-based technologies such as the traffic jam assistant for less tiring driving in dense stop-and-go traffic or the optional parking assistant. Start of production is November 2018, for European markets not until March 2019.